Acoomodation include 1 master + 1 vip + 2 doubles + 2 triples. 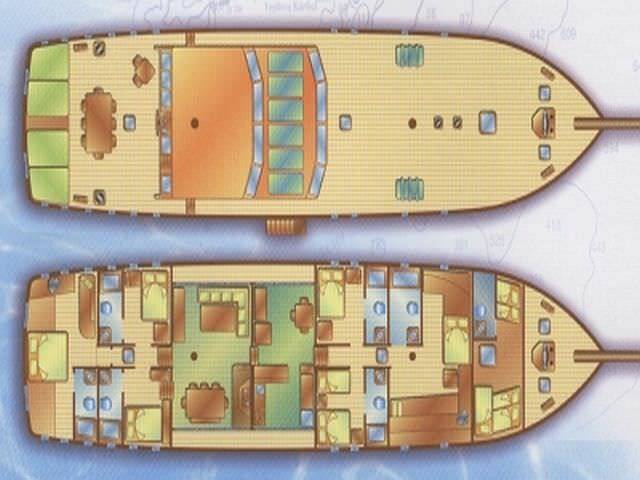 All cabins are en-suite with air-conditioning which can be run 24 hours. ERDEM KAYA, Captain Born , 25.02.1985 in IZMIR, A graduate of the Bodrum Sea Academy, he spent years as captain on private yachts in Italy and the Mediterranean. With immaculate service and hospitality skills, he is also extremely adept with overseeing technical issues and running a very tight crew. Veli DUMEN was born in Eskişehir on the 16.01.1982. Arif SISMAN is Host and very good sailer was born in Aydın on the 16.01.1987. After secondary school he studied carpenters craft, and by now has an impressive record of combining carpenters work at winter time with International Boat company. Raif SISMAN was born in Aydın on the 14.04.1980.